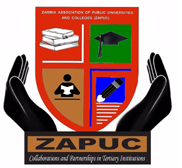 "The role of universities and colleges in sustainable national development"
Zambia Association of Public Universities and Colleges (ZAPUC) is a body corporate representing the interest of public universities and colleges in Zambia. ZAPUC was formed in 2013. The association is committed to quality service delivery to students, government and other stakeholders through mutually beneficial collaborations and partnerships. The association aims to ensure that institutions follow ethical professional standards in the execution of their mandate, finding creative, innovative and modern ways of addressing the higher education challenges of accessibility, affordability (funding) and accountability. This aim shall be achieved through various concerted efforts from all member institutions. Some of the major activities to realize this aim, with the aid of ICTs, include undertaking short intensive training programmes, workshops and conferences aimed at sharing resources, new ideas, innovations, research outputs, challenges and alternative solutions. This will help the Public Universities and colleges to transform themselves in many ways in order to become more relevant, efficient and cost effective. Prof. Ngambi is the Vice Chancellor at Mulungushi University and Kwame Nkrumah University and is the current Chairperson for ZAPUC.